Joint POW/MIA Accounting Command (JPAC), based at Hickam AFB, Hawaii, is the Department of Defense agency responsible for achieving "the fullest possible accounting of all Americans missing as a result of our nation's previous conflicts." * Since 1973, the remains over 800 American service members, formerly listed as missing or unaccounted for in Southeast Asia, have been identified. As of January 2006 there are approximately 1,800 Americans still missing or unaccounted for from that war. This page continues the story of the effort to recover four of these Americans. In January 2002 I saw a message on a FAC e-bulletin board from Bob Baldwin, a retired Jolly Green flight engineer. He had been a crewmember on a helicopter involved in the SAR effort for Hellborn 215 on June 8, 1968 and was working with JTFFA to locate the crash site. He specifically was trying to make contact with two FACs, Trail 33 and Trail 36, who had witnessed the crash. I was very familiar with that incident. I knew both of those FACs, could match names to callsigns and maybe shed some additional light on the search. That message instantly took me back 34 years. On the evening of June 8, 1968, several of the Trail FACs gathered in the MACV compound at Hué to discuss what had been a very eventful day. I had flown a mission that morning in the A Shau Valley and had put in two airstrikes on a truck park I had found. After landing, I heard about the SAR effort which was unfolding west of the Valley and was anxious to learn what had happend. The centers of this informal meeting were Capt. Bob Dubois (Trail 33) and Capt. Charlie Heckman (Trail 36). Bob Dubois was my roommate at Hué and had been in-country since August 1967. He had been in Hué during the Tet 1968 offensive when the MACV compound was one of only two areas in the city to hold out against the NVA onslaught. Bob had shown me the ropes of being a FAC, so I listened with great interest as he told the story of Jolly Green 23. I remember his description of the transmissions from Hellborn 215 on the ground and how, as the events unfolded, the tone of those transmissions changed, convincing Bob that the pilot had been captured and someone else was on the radio. I also recall the sense of frustration in his voice as he told how the rotor of Jolly Green 23 seemed to slow and almost stop just prior to the helicopter plunging to the ground. In subsequent days this description was to lead to several conversations with Army helicopter pilots stationed at Hué on the phenomenon of autorotation. I did not realize at the time that these discussion would have a significant influence on my future and link me to the crew of Jolly Green 23. Charlie Heckman was the ultimate FAC. He was totally dedicated to the mission, really knew his stuff and was cool under fire. He was on his second tour as a FAC and had learned to speak Vietnamese. Charlie had been a Covey FAC flying over the Ho Chi Minh Trail in Laos, so he knew that area and the northwestern part of South Vietnam very well. We all respected him. As I learned that evening, his extensive knowledge of the terrain in our area of operations had saved a helicopter, Jolly Green 28, and its crew during the effort to recover the Marine pilot. JG28 had had an engine shot out during a third pickup attempt and did not have the power to climb over the mountains separating them from the friendly bases to the east along the coast. Each time they attempted to set down in a clearing for pickup by an accompanying helicopter, they were driven off by hostile fire. Because of his knowledge of the terrain, Charlie was able to guide the crippled aircraft north through the valleys to the Marine base at Khe Sanh. I do not know if Charlie Heckman ever received a decoration for this action, but he was a hero that day. There are a lot of Jolly Green crewmembers who would second that. Fast forward 34 years. Through Bob Baldwin's message I was able to make contact with Bill Forsyth, the case officer for the Jolly Green 23 search (officially Case 1206) at JTFFA in Hawaii. Bill and Bob were able to forward the names Dubois and Heckman to the Air Force Personnel Center in an attempt to bring them into the search. The effort to locate Charlie Heckman has not been successful. Apparently he did not stay in the Air Force to retirement, and we have not been able to contact him. Bob Dubois, on the other hand, had retired from the Air Force, and we were able to locate him through retiree records. The biggest challenge was to identify him from among the three Robert Dubois' who retired within three months of one another at the end of 1982. Bob's comments have been valuable in sorting through the conflicting reports filed in 1968. The challenge now is to locate good aerial photos of the crash area and get all the players looking at these same maps and photos. The ideal situation would be to find photos of the area before and after the JG23 crash and use the eye witnesses to direct the focus on a specific small area. Hopefully, a comparison of the before and after imagery will reveal evidence of the crash site of Jolly Green 23. This is easier said than done. Sadly, many of the photo reconnaissance files from the war have been destroyed. Those that are available leave something to be desired in quality and usefulness. In one frustrating case, an otherwise good quality image is marred by a small, isolated cloud over an area of high interest. Many of the products available now are linked from this site for your use (below). 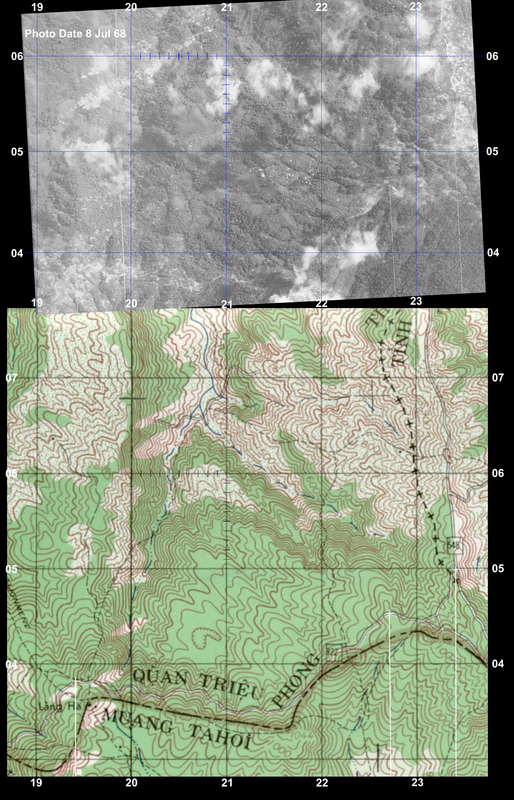 The current effort is focused on locating addition aerial imagery and applying digital techniques in an attempt to pinpoint the exact crash site. Like the search for Jolly Green 23 itself, this effort will not be abandoned until the crew is located and returned home. 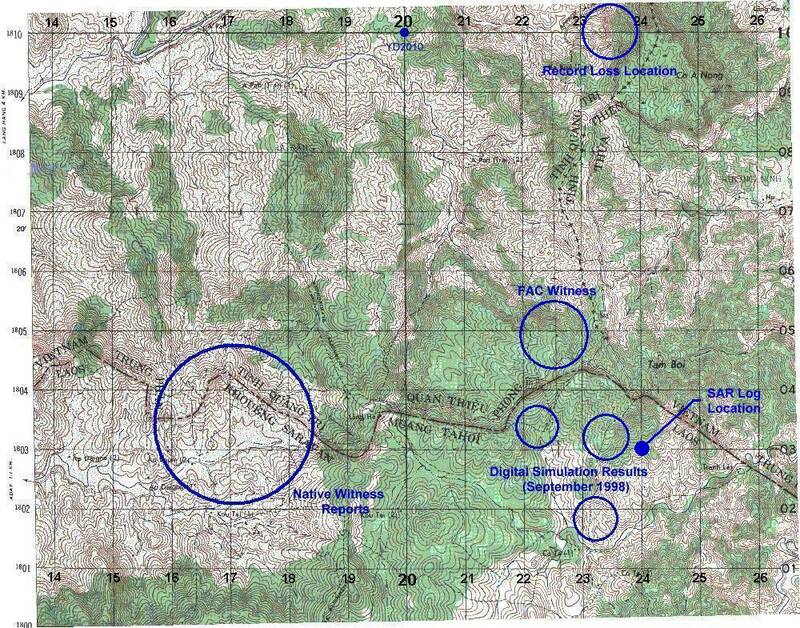 Read about how the Air Force used digital terrain simulation in an effort to locate the Jolly Green 23 crash site. More about this. * In October 2003 Joint Task Force-Full Accounting (JTFFA) merged with the U.S. Army Central Identification Laboratory, Hawaii (CILHI) to form JPAC and assume the mission "to achieve the fullest possible accounting of all Americans missing as a result of our nation's previous conflicts." Click here for Jolly Green 23 Found!